Built as a retreat for the Bishops of Speyer in the Middle Ages, the castle reached the heights of popularity in 1832 when it welcomed 30,000 participants to the Hambach Festival in Neustadt an der Weinstrasse and becoming the cradle of the German democratic movement of the 19th Century. 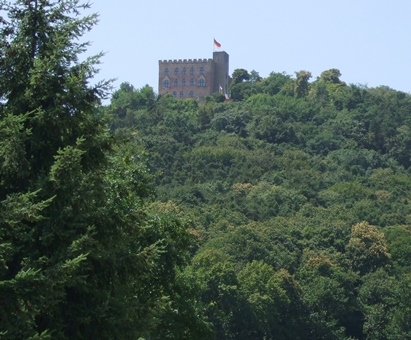 Therefore it was critically important to preserve the historical existence of the medieval castle ruins and its spectacular views of the Rhine Valley during it’s 2006 renovation by architect Max Dudler. 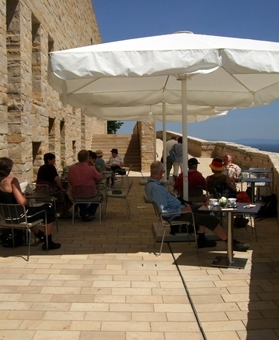 As part of the multi-million pound renovation, a new restaurant building and spacious terrace was constructed along with a complete renovation of the castle courtyard in beautiful yellow sandstone from the Haard Mountains in the nearby Pfalzer Forest. 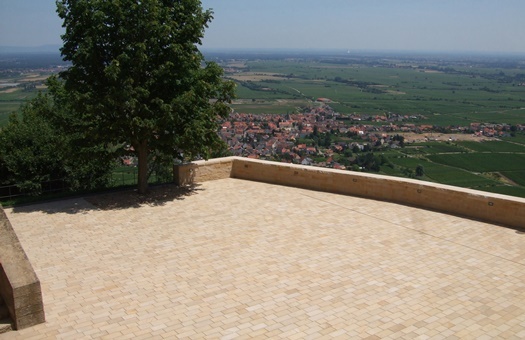 In order to provide drainage and protect the stone from moisture damage, AquaDrain T+ was specified. Traditional loose laying on gravel or chippings was ruled out due to the possibility of water backing up and breaking the seal causing ugly damp patches and weed infestation of the joints. AquaDrain T+ – specially designed for the loose laying of natural stone – is capillary passive and ensures rapid and permanent drainage of the covering structure. The system also serves as a protective layer and filter layer. Due to the large contact area of 66%, high point loads are avoided. An additional protective layer on the sealing is not necessary, while a plastic film made from special geotextile felts is laminated for low flow resistance and additional filter capability. This prevents build-up of gunk on the seal. On the terraces and courtyard of the castle, 16mm AquaDrain T+ mats were rolled out over a sealed surface – a total of about 600 square meters. 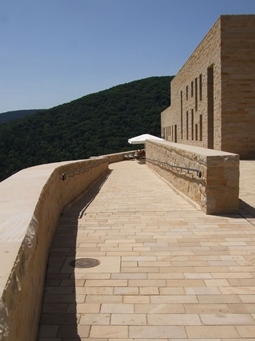 A thin layer of drainage mortar was applied over the matting, before the high-quality sandstone was laid with impressive results.